The story of Dragonfly Framing started as a 'project' to release my photography from the grasp of the PC screen. The digital era has had a profound effect on photography and for many this has led to pictures being stored on hard drives and social networks across the land, never to see the light of day in print. So the idea, to start framing my photography using high quality prints, began. I spend lots of money on getting photography printed professionally to a very high standard, on great papers that show off images to their best, so l want to frame it to the same standard. Using Giclée [Pronounced: Gee ~ clay] printing processes you can achieve supberb results with improved resolution, colour range and longevity of prints. So this is where conservation standard framing comes in. Using pH neutral materials throughout protects your work well, moreover, conservation whitecore mountboard bevel cuts stay white and don't turn brown over time. The photographic paper does not discolour and the latest UV glass is virtually invisible so the viewer is drawn at the artwork rather than their reflection. Photography and art have been an interest for many years now so developing my small but well appointed framing studio is a labour of love, turning a hobby into a profession. It's then a small step to make, to offer a service to others, so that they too can release their work into the open. 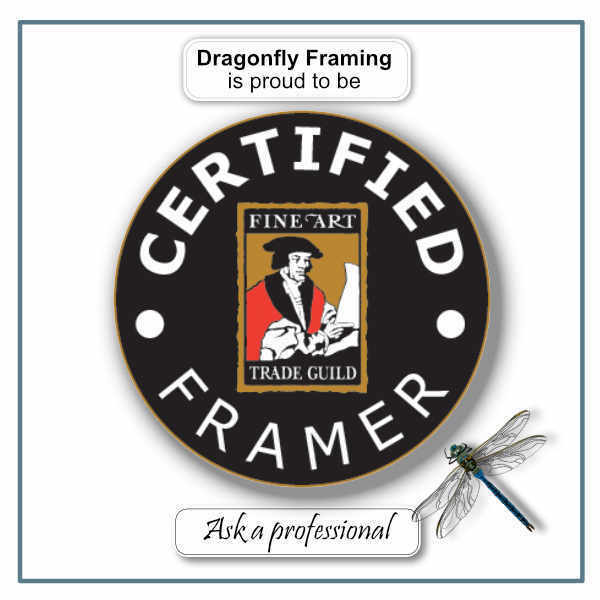 I have been very much inspired by the people and processes I have come across in my journey to create Dragonfly Framing. I have learnt so much about the 'art of the possible' to present unique finished pieces that will I hope will delight for years to come. Whilst I am a keen photographer, I love to to see your art too, whether it's an oil painting, a watercolour or some other format lets work together to present your masterpiece in the best possible way.